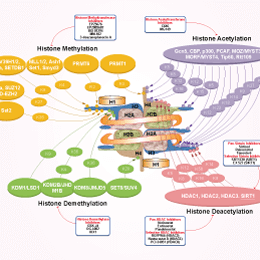 GSK J4 HCl is a cell permeable prodrug of GSK J1, which is the first selective inhibitor of the H3K27 histone demethylase JMJD3 and UTX with IC50 of 60 nM in a cell-free assay and inactive against a panel of demethylases of the JMJ family. OG-L002 is a potent and specific LSD1 inhibitor with IC50 of 20 nM in a cell-free assay, exhibiting 36- and 69-fold selectivity over MAO-B and MAO-A, respectively. Effect of treatment on equine herpesvirus type 1 (EHV-1) viral load during lytic infection of primary equine fetal kidney cells. At 24 hpi, reduced EHV-1 DNA copies per cell were detected in the presence of ganciclovir (**p = 0.0005) or OG-L002 (*p = 0.005), and markedly when both treatments (***p < 0.0001) were applied simultaneously in comparison with DMSO control vehicle. Combined treatment decreased the number of EHV-1 DNA copies in comparison to treatment with ganciclovir alone (p = 0.01) or OG-L002 alone (p = 0.001). Lines represent mean values. JIB-04 is a pan-selective Jumonji histone demethylase inhibitor with IC50 of 230, 340, 855, 445, 435, 1100, and 290 nM for JARID1A, JMJD2E, JMJD3, JMJD2A, JMJD2B, JMJD2C, and JMJD2D in cell-free assays, respectively. ML324 is a selective inhibitor of jumonji histone demethylase (JMJD2) with IC50 of 920 nM. CPI-455 is a specific KDM5 inhibitor with a half-maximal inhibitory concentration (IC50) of 10 ± 1 nM for full-length KDM5A in enzymatic assays, elevating global levels of H3K4 trimethylation (H3K4me3) and decreased the number of DTPs in multiple cancer cell line models treated with standard chemotherapy or targeted agents. AS-8351 is a histone demethylase inhibitor that could induces reprogramming of human fetal lung fibroblasts into functional cardiomyocytes. GSK-LSD1 2HCl is an irreversible, and selective LSD1 inhibitor with IC50 of 16 nM, > 1000 fold selective over other closely related FAD utilizing enzymes (i.e. LSD2, MAO-A, MAO-B). ORY-1001 (RG-6016) 2HCl is an orally active and selective lysine-specific demethylase LSD1/KDM1A inhibitor with IC50 of <20 nM, with high selectivity against related FAD dependent aminoxidases. Phase 1. Cells were exposed to drugs for 48 h or for the indicated times. Cell death and Dwm dissipation were determined by flow cytometric analyses of propidium iodide uptake or DiOC6(3) staining, respectively. Caspase 3/7 activity was determined using the fluorogenic substrate Ac-DEVD-AMC; relative caspase 3/7 activities are the ratio of treated cells to untreated cells. GSK-J1 is a highly potent H3K27 histone demethylase inhibitor with IC50 of 28 nM and 53 nM in cell-free assays for JMJD3 (KDM6B) and UTX (KDM6A), respectively, >10-fold selectivity over other tested demethylases. GSK2879552 2HCl is a potent, selective, orally bioavailable, irreversible LSD1 inhibitor with Kiapp of 1.7 μM. Phase 1. Effects of LSD1 inhibitors in acute myeloid leukaemia cells. Cells were exposed to drugs for 48 h or for the indicated times. Cell death and Dwm dissipation were determined by flow cytometric analyses of propidium iodide uptake or DiOC6(3) staining, respectively. Caspase 3/7 activity was determined using the fluorogenic substrate Ac-DEVD-AMC; relative caspase 3/7 activities are the ratio of treated cells to untreated cells. Means±SEM of each two (caspase 3/7 activity) or three (flow cytometric analyses) separate measurements are shown. SP2509 is a selective histone demethylase LSD1 inhibitor with IC50 of 13 nM, showing no activity against MAO-A, MAO-B, lactate dehydrogenase and glucose oxidase. CP2 is a cyclic peptide that inhibits the JmjC histone demethylases KDM4 with IC50 values of 42 nM and 29 nM for KDM4A and KDM4C, respectively.